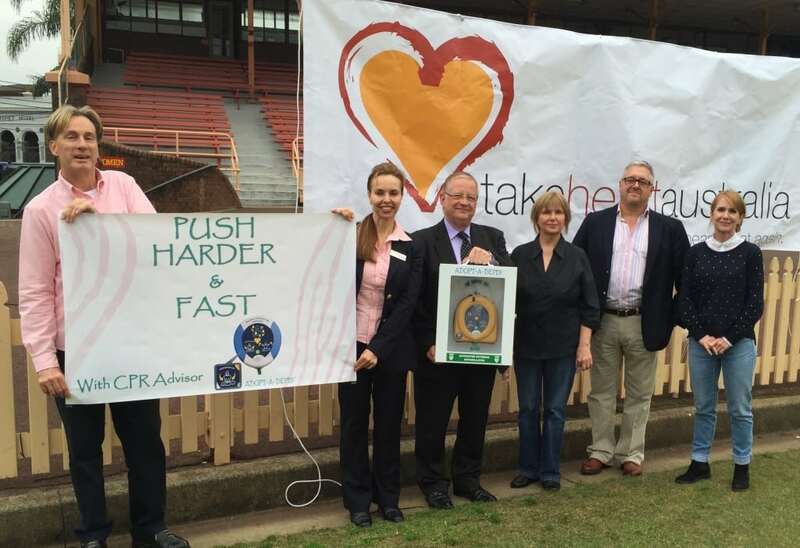 John and Elizabeth Lucas (center) joined by staff from Adopt-A-Defib™ and Take Heart Australia. Earlier this year, while at home John Lucas suffered a Sudden Cardiac Arrest (SCA) that that almost caused him to lose his life. Fortunately, his household kept a HeartSine Automated External Defibrillator (AED) on-hand, as his son was diagnosed with a heart problem that can lead to SCA. When Lucas experienced the SCA, he suddenly collapsed on his bedroom floor. Within seconds, his wife, who is cardiopulmonary resuscitation (CPR) and AED trained, called the emergency services, began CPR, and asked her son to retrieve the nearby HeartSine AED. Lucas’ wife began administering the chest compressions then connected the HeartSine AED to his chest. The device assessed his heart and guided his wife through CPR advising her to “push harder’, “push faster” or “push slower” so that she performed optimum compressions on her husband. Thanks to the device’s verbal feedback, Lucas received proper high-quality CPR, which bought him time and kept him alive until the paramedics took over. As part of HeartSine’s Forward Hearts program, which allows survivors of a SCA event, in which a HeartSine defibrillator has been used, to potentially save another life by donating a HeartSine samaritan® PAD to the charity or organization of the survivor’s choice, Lucas has donated a lifesaving AED to Northern Suburbs Rugby Club, one of Sydney’s most historic rugby union clubs. The device will protect the club’s players and its thousands of spectators in the event of a SCA. The donation is courtesy of HeartSine and its distributor, Adopt-A-Defib™. Sudden Cardiac Arrest is a condition in which the heart suddenly and unexpectedly stops beating, causing blood to stop flowing to the brain and other vital organs. SCA happens to people of all ages, including children, and is often fatal if not treated within minutes. SCA claims more than seven million lives annually, and in Australia alone, around 30,000 Australians suffer a sudden SCA every year, and on average, only one in ten survive, making it imperative for all homes and public places to have an AED on-hand. Learn more about HeartSine’s line of AEDs by clicking here. Click here to read the full news feature.